Ollie Schvents grew up in Minnesota in the early 19th century. He was an adventurous lad and constantly was out in the woods tromping around. At times he might be missing for a week but his parents had finally learned to accept the way he was and they allowed him his ‘out time’. Ollie loved wild animals and he grew to learn from them as he watched nature’s progress in his wilderness. There were not many people in the area yet and he enjoyed being as an animal while wandering around in the woods. He managed to miss most of the education that his parents felt he needed and finally they stopped pushing him to the book learning. He always told them he was far ahead in his education from nature. His parents had to admit that he needed nothing to survive out in nature and he was definitely happy with living there. By the time Ollie was sixteen years old he had very long hair and a weathered face. His parents began seeing him less each month and they knew soon he would probably never return home. Ollie began venturing further out into the wilderness and finally he headed toward the western direction. He soon found that the land in this direction was very open and this presented him a challenge to survive while he moved through this land. He watched and learned from animals to survive on his own. He began acting more like a coyote as he caught things to eat. He ran into small groups of Indians while he was moving along and they gave him a wide range. They seemed to think he was crazy or something. This did not bother Ollie since he had no wish to get involved with other humans right now. Ollie moved steady toward the west and he could see that winter would be coming before long. He could get himself a burrow to survive the season but he finally decided to move to the south where the land was somewhat warmer. A hard winter in the north could leave a person very hungry. After traveling long distances through the barren land he finally found some great mountains. This was new to him, as he had never seen such things. He did soon learn that the area was easy to survive in but also was getting very cold. With this he headed south again. Without intending Ollie lived through the winter while he was moving south. He did not have a bad time since he was on the move and ate as he could. The snow and hard wind did not bother him as he moved along. One day while he was moving along he slipped on some icy rocks and his leg was twisted and he heard a loud snap. His leg suddenly hurt badly. He figured he had broken his leg. He knew that most wild animals that broke legs would soon die. He sat thinking through his injury and trying to figure what to do next. He found that when he held his leg straight it felt better. He gathered a couple of larger sticks and managed to bind them on the side of his leg with some vine he found. This helped the leg a lot and he next found an old Indian dwelling under a cliff. He moved in to get out of the weather and see if he could get food there. He found that many small animals were not that afraid of him so he settled down to allow his leg to get well. He managed to stay awake at night and he could catch rabbits as they came too close to him. If he was fast and did not allow them to squeal they would not frighten off others. So Ollie was getting food and in a protected environment for the time he needed. After many days his leg was in good shape and he was feeling the increased heat from the weather. He headed on and hoped to find some mountains that would be cooler. He carried a larger stick he had found and hoped it would assist him in moving by giving him additional security from falling. He came to an area of barren land that had many large structures rising without touching others. These were some way apart. He also had seen some other Indians in this area but as before they stayed off from him. He could wave his stick in the air and these Indians would turn and run rapidly from him. Ollie soon arrived in an area that had some mountains that had trees growing on them. He was enjoying all this and was happy. The weather was not real hot and he was able to gather food from berries and such besides small animals. He soon was joined by more Indians in the area and these did not seem to be afraid of him as others had been. One night in a camp he had made, a small group of warriors came in. They were jabbering and he couldn’t understand them but they were not acting in any threatening way toward him. They had their food with them and a brave started a fire. These Indians cooked their meat and gave some to Olli. The group sat around and jabbered almost constantly. Finally an Indian got up and walked to Ollie. He looked at him and then pointed to his leg. The Indian walked a little then with a slight limp and Ollie now knew they were discussing his leg that had been injured. He figured he probably did limp some with it. The Indian returned to Ollie and spoke slowly saying “Co tak” as he pointed to Ollie’s leg. Ollie had to laugh even though he did not understand. Soon everyone at the fire was looking at Ollie and saying “Co tak”. Finally everyone found a place to lie down and the night was over. The next day the morning came after everyone was up. An Indian handed Ollie a piece of dry meat and again said “Co tak” to him. The Indians got together and started to move out. A couple of the braves motioned for Ollie to come also so he did as he had nothing else to do anyway. This started a long history for Ollie with the Indians. He learned their language and they were Apache. His name that he now learned was “Co tak” which meant ‘two step’. He kinda liked this name and the Indians treated him as if he was one of them. They accepted that he was able to care for himself and a friendship grew between him and the tribe. This tribe lived among the mountains and the lower desert floor that their tribe spread over. Ollie had become the same as a member of the tribe and many of the chiefs had tried to get him to marry a woman of the tribe. Ollie had no use for a woman as he could see so he stayed alone. He did enjoy the tribal dances and participated in these plus warrior games. He was a very hard person to beat in the games. Years past and Ollie was living among the tribe plus out on his own at times. The tribe had accepted the fact that he was a special individual and let him do his thing, much as his parents had. Ollie did enjoying finding the yellow metal that the tribe had shown him and he would fashion this into pretty little charms for the women of the tribe. The Indians had no use to this metal and until now they could see no worth in it. Soon the warriors were seeing that gifts to the women of the tribe were special and Ollie was gaining some great privileges from these gifts. Now the young braves were watching Ollie very close and they were learning how to find and make these small gifts. Before long Ollie began learning to hide his gathering of the metal and keeping clear of warriors that followed him. As the time marched on, Ollie began getting further and further from living with the tribe. He had gained a lot of years now and he was looking as if he was very old. The weather had hardened his face and it showed a very old man. Ollie was still very limber in his body but at times he would act as if he was having trouble with sitting and standing. This was a way of fooling warriors who were following him. Things finally came around to the place that Ollie had to leave the tribe. He had seen other humans just out of the mountains and he wanted to be close to some humans in order to get his special way with ladies of the various tribes. He knew his metal work would always keep him in communication with these various ladies. He wandered toward a new camp of other humans and when he arrived he found the place was occupied by white people like his parents. He began a new life now and found that their dances were even more fun than the Indian ones. He kept his name as ‘two step’ until people at a dance were surprised that he could not dance the two-step. He had learned another dance as a very young child that his parents had taught him. This was the waltz. Now he was displaying his abilities with this dance and before long he was being called ‘Mr. Waltz’ by the white people. Ollie continued his gathering of the yellow metal for making trinkets for the ladies and he soon learned this metal was called ‘gold’. He managed to disappear many times into the mountains and was very adapt in hiding his trail from both Indians and white men. Many people had tried to follow him but none were able to do such. Soon Ollie found that this metal was valued by the white men and he could get many things to make his life much nicer. Although he was looking as a man into this late seventies, he was actually almost a 100 years. He was in very good condition for his age and he knew his activity in the wilds had helped him with this. Rumors spread rapidly about his “gold mine” in the Superstition Mountains but no one had been able to follow him and find it. Ollie had obtained a burro to assist him in carrying things for his personal use in the wilds and he could hide the burro as well as himself while he was in the mountains. This assisted him with his older age now as he was feeling the age. He no longer needed special privileges from the ladies and he was finding that humans were more depressing everyday. He finally left town and moved into the mountains and was never seen again. Stories have developed over the years about this man and who knows but what the man is still living a grand old time hidden within the mountains. ICEX Intelligence: Get it Here! He was an Army intelligence agent during his six year tour with the Army. 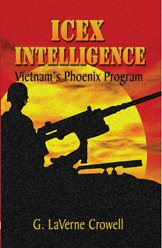 He was assigned duties with intelligence positions as an agent in the States and "Phoenix" while in Vietnam.